Last Tuesday's post was about fitness, so I thought today's should be nutrition since they go hand in hand. If we were a car we would try to put good gas in our cars and replace the oil with clean oil. So, shouldn't we also put good clean food into our bodies? There are so many opinions out there on what diet plan is the best. I am not a nutritionist and by no means an expert. It is something that intrigues me so I have researched and learned about it a bit. It only makes natural sense to try to eat things as close to their natural source as possible. 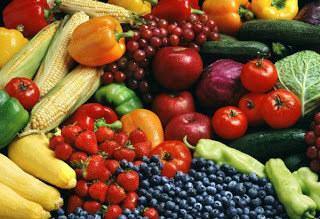 So, raw fruits and vegetables of course are great for us. What about grains? I recently attended a class that was about this subject. The two natural or heirloom grains are Kamut and Spelt. From what I hear these are great grains that are also easier to digest and people who have problems with gluten, seem to be fine using these grains. What about meats? Go lean. I personally do not buy ground beef, I hate the texture. Instead I buy lean ground turkey. I use it in any dish that calls for ground beef. I use it in my taco meat, my lasagna, my veggie meatloaf, even my chili. It has a much nicer texture and I think it taste just as good if not better. Here are some tips that I go by. I only use whole wheat breads and tortillas, if it says enriched in it I don't buy it. I don't but the extra fluff on my food, that add fat. I don't use sour cream, if I did I would go for the non-fat. I don't usually use butter on my veggies and such, instead I season with seasoning. I also alter my recipes to my needs. If something calls for flour, I will usually do half wheat, half white. I usually do not put as much sugar in my recipes as it calls for. Instead of oil or butter in my banana bread I us applesauce I don't drink my calories either, I drink water. Breakfast: Thin whole wheat bun with natural peanut butter and half a banana sliced on it. After workout meal (mid morning about 10-ish): Protein shake with water and ice and half a banana, sometimes some berries. Lunch: Thin whole wheat bun with sliced turkey, pickle, pepper jack cheese and lettuce. Or I will do eggs on the bun with pepper jack cheese. The pepper jack just gives me some seasoning, I don't have to put any condiments n it. I also usually have a piece of fruit. After-noon snack: Protein granola type bar, or some nuts and light string cheese. Dinner: My dinner usually consists of lean meat, a veggie, and a side such as quinoa, brown rice or yams. Now, I am not perfect! Sometimes I have the sweets, sometimes I have the pizza, etc. I think the key is to just try to do your best and be good most of the time. Remember the goal is to help our bodies be healthy and to help fuel them for the things we have going throughout the day. Maybe in following weeks I will post some healthy recipes. The picture at the top comes from I found on this Site.